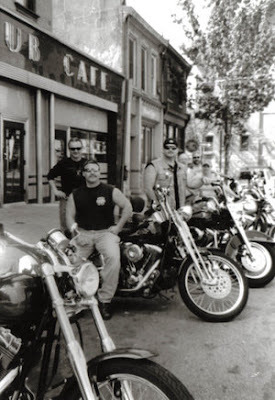 I've always been fascinated by the outlaw bike clubs around the country. Even seen a couple of Mongols out walking one time and remember feeling like I was watching a couple grizzly bears in the city. Dangerous by fascinating. Recently I read some books on the ATF infiltrating outlaw bike clubs. The agents going through hell "patching-in" which lasts a year or more, and seeing a ton of gnarly stuff go down. Even enduring all of that, they still wouldn't be so sure that they wanted to leave the club when the order came down to bust these guys. The hard outlaw badasses were more genuine and giving than any other person, even the people on their own police force. It was a serious head trip. But then they remembered how sketchy these big bearded tattooed dudes were...murders, attempted murders, numerous assaults, corruption, rackateering, drugs, heavy artillery and everything else. Apparently, 4 more ATF agents infiltrated the Mongols over the last several years. And this is just after another ATF infiltrated, and patched in, around 2003. Either the ATF dudes are really good at undercover work or the Mongols are easy to fool. So in the early AM dawn, there was a huge vast shakedown on the Mongols. Feds bustin' down doors and taking names. Sixty-one grizzlies rounded up, a lot of them high ranking members. From Florida to Ohio Oregon to Vegas to Los Angeles. Even a couple in Lincoln Heights! Waylon Jennings "Ladies Love Outlaws"
DJ Shadow "Mashing on the Motorway"